It was only a matter of time before a little company like Apple would want a piece of grapefriend. We’re both fruits after all, and apparently they’ve been very influenced by what’s been going on here. So much so that they’re probably making their next iPhone Champagne-colored. Now obviously there are lots of rumors that always swirl around before the next-gen iPhones are released (the 5S is supposedly coming out in September). But according to this report, these iPhone 5S parts pics called “Apple iPhone 5S Champagne Button Set” were posted on a parts retailer’s website. 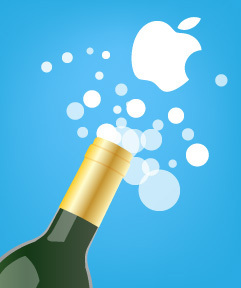 And Apple would just be stupid not to make a wine-related color. Next they should be thinking about a Pinot Noir shade, and a Cabernet and even rosé colors. Finally, the Genius Bar will be able to act on its intended meaning and pour out some Champagne while you’re waiting for your stuff to get fixed. Tags: apple, cabernet, champagne, iphone, pinot noir, Rose, wine. Bookmark the permalink. Just exchanged comments with Yoonanimous about the new iPhone rumored to be in gold. If it’s officially called Champagne, I want it more! I do too! Unfortunately I just got a new one a month ago, so I won’t be gettingit no matter what color. I think Grapefriend IS the Genius Bar. So there!